"The paper quality is excellent and when the prints are presented to our patients and referring physicians, they are really amazed at their beautiful representation." Speed, versatility and affordable purchase price were all a plus. But, for Chile's largest and most prestigious hospital, the key benefit of the Codonics Horizon© Multi-Media Dry Imager was the ability to put it all on paper. Their new Codonics imagers enabled a shift to economical Direct-Vista™ Grayscale and ChromaVista™ Color Paper use for most day-to-day radiology printing at the Pontificia Universidad Catolica Medicine School (PUC) in Santiago. At the same time, the imagers support output on film in a full range of sizes to cater to referring physicians' individual preferences. The move to high-quality paper cut printing costs by over $150,000 annually compared to its previous specialized film-only imagers-with no compromise in quality. Today, eight Codonics Horizon dry imagers hum with activity around the clock at the multi-site teaching hospital. With unmatched versatility, image quality and speed, the printers meet the hospital's full spectrum of hardcopy needs. Complementing this, PUC's Codonics Virtua® Medical Disc Publisher enables the hospital to store exams to modern, efficient CDs and DVDs, providing another popular modern storage option. Codonics technology is an important part of PUC's ongoing commitment to timely, high-quality medical care, which has been the hospital's hallmark since it was founded in the 1930s. From its beginnings in general medicine and surgery, PUC has grown into a multi-disciplinary hospital meeting a complete spectrum of medical needs. Its three locations are dispersed throughout Santiago, Chile's largest city with seven million residents. They include the main hospital at the Pontificia Universidad Catolica Medicine School, as well as the San Joaquin and Alcantara Centers. The largest radiology department in Chile, the hospital's 25 radiologists and 24 residents are responsible for reading 240,000 exams in a full range of modalities each year. They have relied on the efficiencies of digital imaging since 2003. And while radiologists interpret their advanced multi-modality exams on digital workstations, the department has a significant need for hardcopy images for referring physicians as well as for patients. 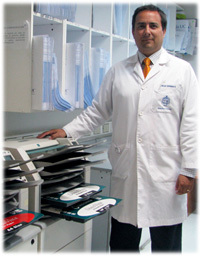 "Our image quality on DirectVista Paper is excellent, and the paper is cleared per FDA guidance for radiographic imaging procedures and, of course, it's far more economical than film, saving us as much as 70 percent," notes Oscar Enrique Contreras Olea, M.D., Chief Radiologist for Pontificia Universidad Catolica Medicine School. "And it's incredibly convenient. Patient consults are also accomplished more easily using images on paper because it completely eliminates the need for a light box." Given its need for hardcopy, for a number of years the hospital relied on eight large film-only dry imagers for the bulk of its printing. These imagers occupied valuable space in the facility, were slow to operate, and did not meet the hospital's need for color printing for such applications as nuclear medicine and Doppler. For these specialized studies, the hospital had two additional color printers from another vendor. "Cutting print costs became a priority," explains Dr. Contreras. "We had no particular need to continue to print on the costly diagnostic quality film for non-diagnostic uses. So we considered the move to paper, and replaced the systems with two Codonics Horizon Imagers." Radiology staff already had been impressed with Horizon's quality and speed. After carefully investigating its performance on the grayscale paper media, PUC purchased an additional six imagers, bringing its total number of Horizon imagers to eight. "We also were extremely impressed with the Horizon's versatile, multi-media output that would allow us to complement paper with film as needed," notes Contreras. And what a complement the color prints can be. "When we saw the vibrant color capability of Horizon, we were really impressed. The color prints accurately match the monitor colors which is so important in an application such as nuclear," added Dr. Contreras. "The paper quality is excellent and when the prints are presented to our patients and referring physicians, they are really amazed at their beautiful representation." Today, the Horizon Imagers service all three hospital sites and are in good company, running alongside equipment from such other major vendors as GE, Philips and Siemens. Designed for ease-of-use and flexibility, all Horizon models are DICOM-compliant and support all modalities. They may be configured for direct connection to acquisition devices or attached to a network, as they are at PUC. Effortlessly meeting the hospital's high-volume needs, the Horizon imagers deliver 14x17-inch, A and A4 black-and-white prints on economical Codonics DirectVista™ Grayscale Paper, as well as A and A4 color prints on ChromaVista™ Paper. They also support monochrome 14x17-inch, 11x14-inch, and 8x10-inch prints on both blue and clear film. Specialized imagers, such as the Horizon XL for orthopaedics, accommodate true-size long bone and scoliosis studies up to 51" in length on one continuous sheet of film. Although lightweight and compact, the hospital's Codonics imagers allow simultaneous loading of three media types, saving technologists' significant time not having to swap out cassettes when catering to the needs of referring physicians" notes Dr. Contreras. "We keep the printers stocked with both paper and film in various formats so that we can easily select the appropriate media, eliminating waste and cutting costs. Our technicians and radiology department personnel can change trays and clean the device easily. Codonics Horizon Imagers represent a true breakthrough in hardcopy imaging." The Horizon's compact size has eliminated both the need to keep unwieldy imagers in hospital hallways and to maintain a dedicated central print room. Codonics imagers are extremely reliable, according to Dr. Contreras. On the rare occasion that the hospital does experience a problem, it can often be remedied on the phone with Codonics technical support. If not, the company delivers a replacement imager the next day. The Codonics digital SmartCard stores all the printer's settings and transfers them automatically to the new imager to streamline setup. This minimizes any printer downtime and keeps the hospital's busy radiology workflow on track. According to the hospital's chief CT technician José Vidal, some physicians were resistant to the switch to paper in the beginning, but today most have changed their minds and now view it as a high-quality and modern print media. Dr. Contreras says the vast majority of images are delivered to referring physicians on Horizon DirectVista Grayscale Paper. "After a short transition, the overwhelming number of our referrers and others needing hardcopy images were very satisfied with the quality of the image on paper. Many prefer this media because they no longer have to rely on a lightbox." Each month, the hospital prints about 33,000 images on 14x17-inch and 5,000 images on A-size black-and-white paper and 1,400 on color paper. About five percent of the hospital's referring and consulting physicians continue to request film. Meeting this need with crisp, detailed, diagnostic-quality images, Horizon satisfies the most demanding hardcopy applications. A unique direct thermal printing technology and precise film advancement system create a continuous film image without the lines and spaces that may characterize other imagers' prints. Today, increasingly, image communication at the hospital is also being accomplished using CDs and DVDs, and Codonics fills that need with its Virtua XR Medical Disc Publisher. The world's fastest medical disc recording system, Virtua XR is specifically designed for high-volume imaging applications with an unrivaled recording speed of over 60 CDs or 30 DVDs an hour. According to hospital PACS Administrator Susana Farias, the Virtua System is quick, robust, and extremely user-friendly. Virtua's HL7 interface allows them to include the report with the study, and the full color, customized label on the disc boasts the hospital's logo to help with marketing. As the demand for electronic image storage grows, the PUC is considering installing additional Codonics Virtua recorders. It also plans to purchase two new Horizon imagers for its newest Santiago location set to open shortly. Clearly, Pontificia Universidad Catolica Medicine School will rely on Codonics to open new horizons in imaging efficiency long into the future. 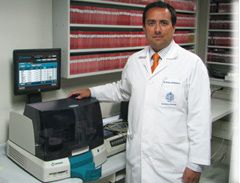 Oscar Enrique Contreras Olea, M.D.